RESCUE BOAT CRANE "ABS TYPE APPROVAL" MCA LY2, LY3 Electro-hydraulic crane designed for Rescue Boats handling, entirely built in stainless steel, part varnished , part polished. Measures and load capacity on request. ship davit / MOB boat / manual RHS.L.S. fied MED by GL. OTHER FERRI EQUIPMENT INSTALLED: 8.5m. gangway. An MOB (man overboard) boat davit is a metal structure for rapidly launching and retrieving rescue craft. NauticExpo offers hydraulic and electric versions, and those with stowage cradle, among others. These devices must be operable when the ship is underway. The operation of different davit models depends on design and motor type, electric, hydraulic or another system. The davits must be capable of handling rescue boats while the ship is underway. 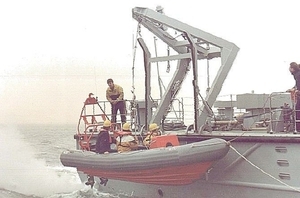 MOB craft usually are stowed on pivoting davits, which can be operated rapidly.